New machinery is helping this 40 ha forester to improve productivity, efficiency, income, care of the environment and workplace safety. It has also improved his returns from servicing the many small forest owners in the region. Ciril Brečko owns 40 hectares of forest in Dolenjska, in the southern part of the country. Besides managing the farm woods, Ciril and his workers are registered to provide forestry machinery services to other private forest owners. Such services are highly valued, as the region is dominated by small forest estates where the owners are neither well trained nor equipped to work in the woods. The application was made using two public calls for projects within the same measure. The first was the purchase of a fixed winch tractor, chainsaw and protective forestry equipment. And the second was the purchase of a three-point hitch winch tractor. The planned benefits are now being realised. Efficiency and productivity are raised, resulting in more work can be undertaken per month, in a safer environment, producing more wood for further processing and sale to market for the Brečko farm and the clients he services. The overall effect is an increase in farm income. 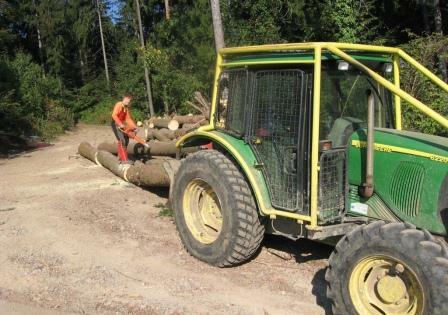 Machinery utilisation has been further raised through it now being made available for local training courses conducted by the Forest Advisory Service. Plan well in advance - at least a year before you want the investment to eventuate. Know what you want to purchase, the price and all the terms of the suppliers. Only buy equipment that meets the needs of the business - don't over-capitalise just to get greater funding. Made good use of the advice services available, for meeting the application requirements. Think about adding extra value (e.g. machinery used for training) - every little helps.